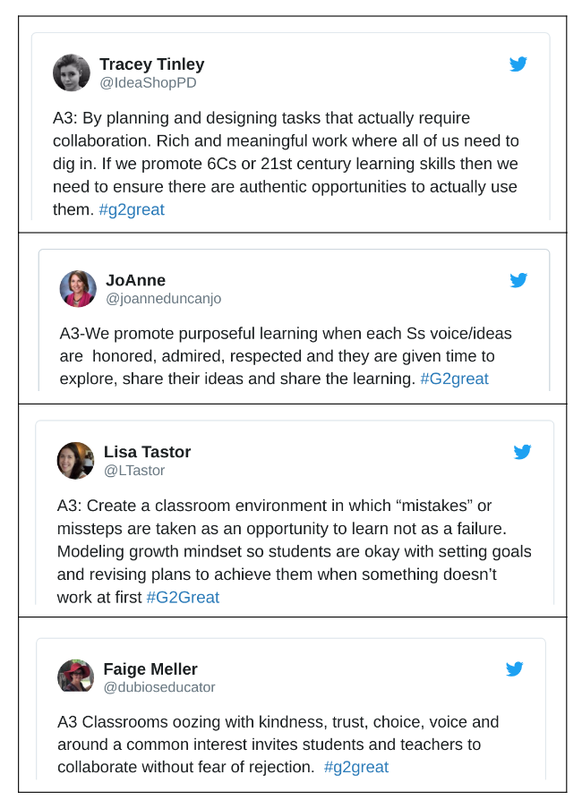 This week #G2great was delighted to highlight a much-needed topic that has been a recurring theme over the past four plus years of our existence. 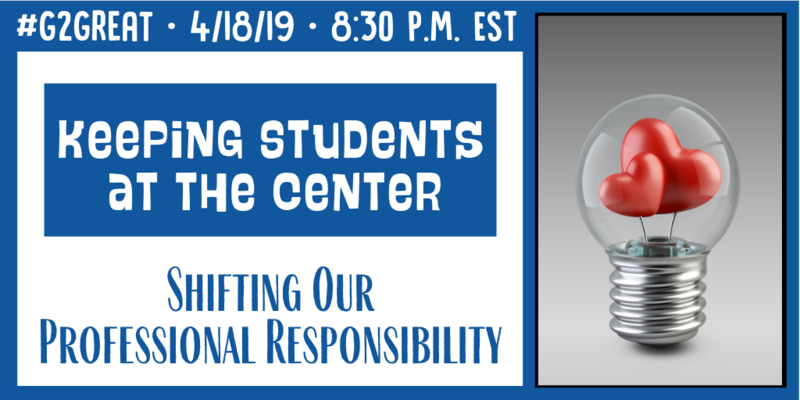 On 4/18/19, we engaged in enthusiastic collaborative dialogue for Keeping Students at the Center: Shifting Our Professional Responsibility. Your co-moderators (Fran, Val, Jenn, Amy, Mary) are committed to our collective responsibility for ensuring that children are given a seat of honor center stage of our professional priorities. 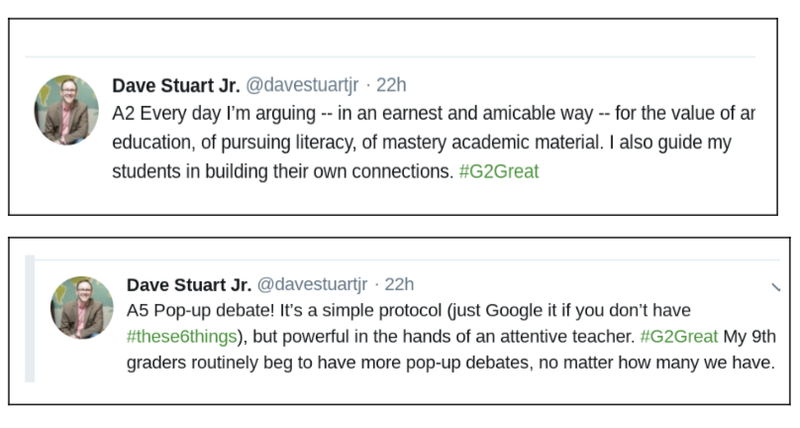 Judging by the #G2great Twitter response, it seems clear that this is a common sentiment expressed by many educators. 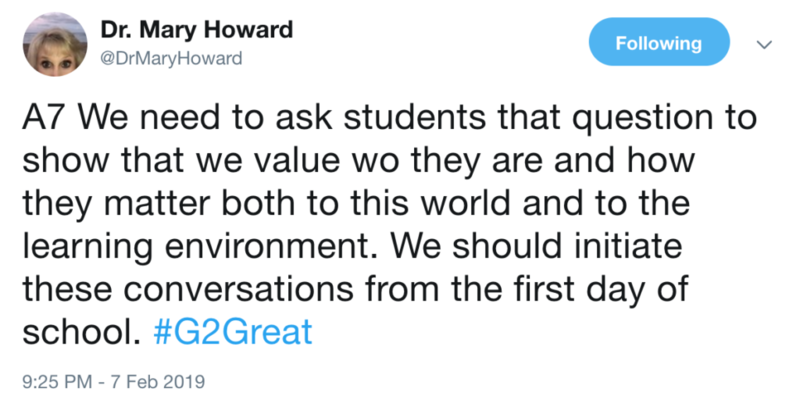 I was thrilled to be afforded the opportunity to write this after-chat reflection on a topic near and dear to my heart. Keeping students at the center of all we do is challenged in an age where programs, agendas, mandates or personal desires compete for attention. Too many schools are the poster child for how not to keep children at the center; a model for what happens when actions confiscate values and our unwavering desire to put kids above all collides with reality. When things compete for our focus on children, a professional tug of war invariably thwarts our efforts to awaken a “child first” spirit. As I perused the inspired tweets following our chat, I kept returning to question 1 that epitomizes this spirit. 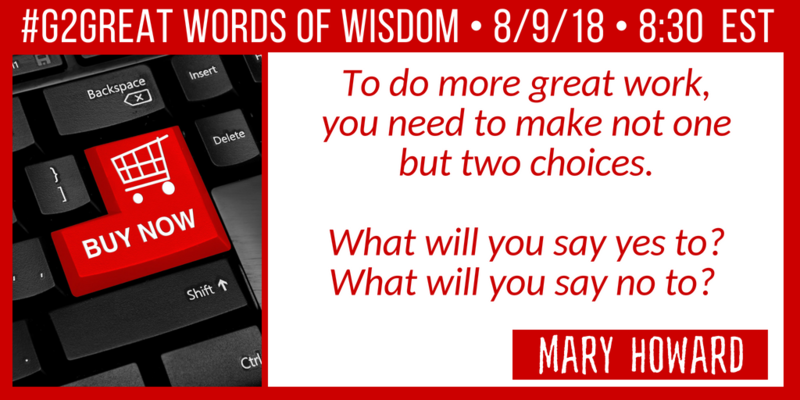 I realized that in order to put children first so that we can keep them at the center, we must use the language that reverses our sense of priorities with the “YOU” that breathes life into this spirit. 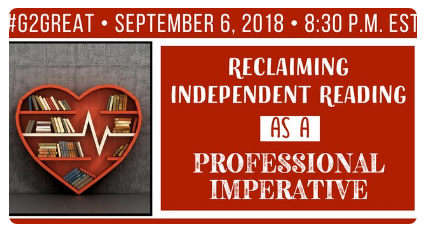 When our practices are riddled with a ME-WE mentality of personal or schoolwide agendas, we turn a blind eye to those who should be the central informant for all we do – children. 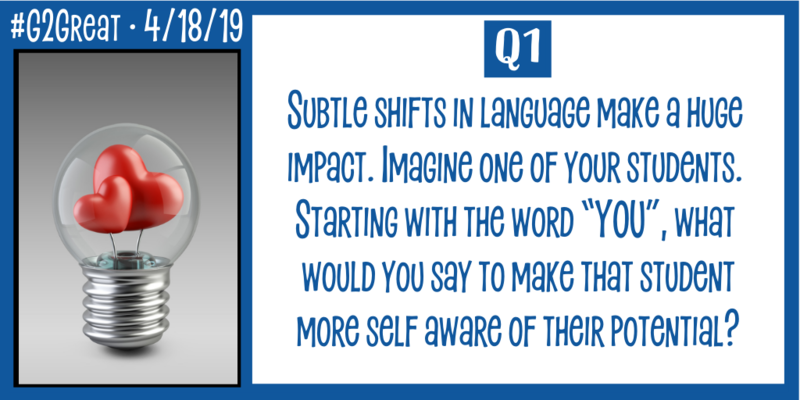 The more I thought about this idea, the more I realized that this YOU-centered question warranted my reflection focus. I returned to my lengthy collection of tweets and centered my thoughts solely around those based on question 1. 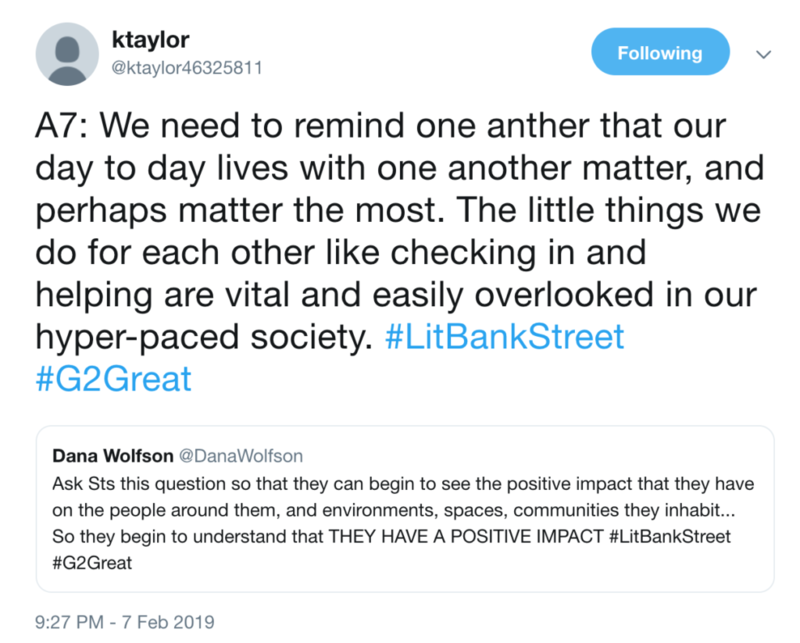 In this post, I will spotlight twelve tweets followed by my brief refection. Kim highlights the starting gate of YOU. Before we can bring YOU to life, we first build relationships to demonstrate that we value our children. 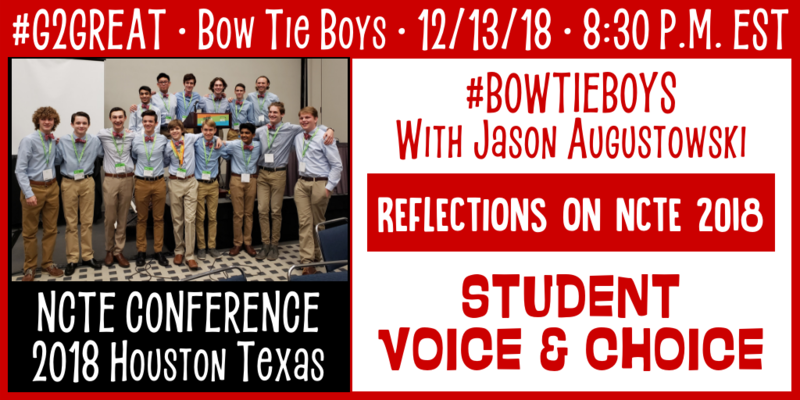 Kasey reminds us that YOU is a invitational event that connects us both. Through these shared experiences, wonderful realizations come into view. 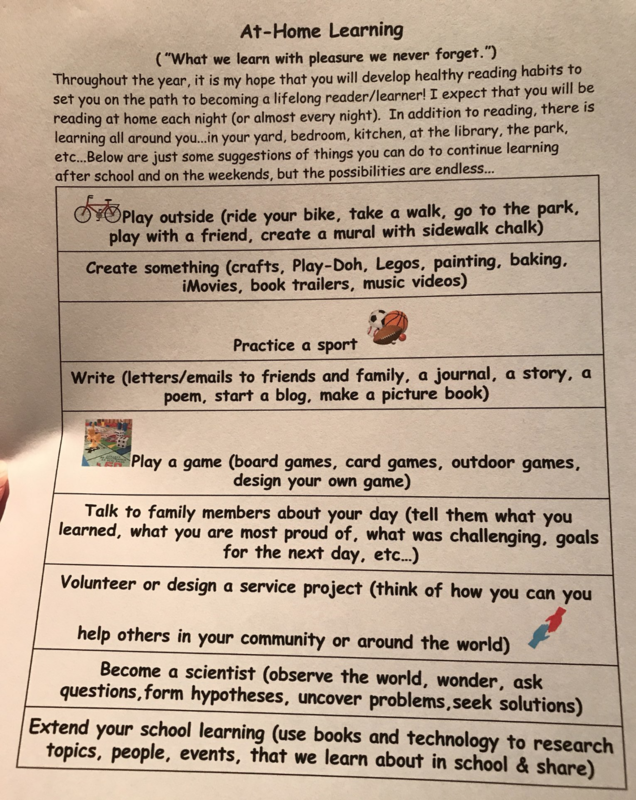 Laura recognizes that we could learn much about children if we celebrate the daily agenda free writing about reading that illuminates who they are. Cara emphasizes that giving writing a public audience within a personal blog space offers insight into the thinking that rises from this experience. Valinda shows us that teaching and learning are a collaborative event. If we are brave enough to changes sides with our children, we gain so much. Mary Anne continues the student as learner perspective by using their reading and writing as visible references to support instructional choices. Mollie illustrates that being a learner is about our history of experiences. This history can help us by looking back so that we may ponder next steps. Jenn points out that our carefully selected learning tools can enhance this learning. Scaffolds offer supportive stepping stones from NOW to NEXT. Derrick underscores that we teach with our sights on empowering our children. Independence is seen as the ultimate goal of our focus on YOU. Julie asks us to look squarely at the core of YOU. When we respect that learning is closely linked to confidence, we make that our daily priority. Fran extends the role confidence building plays by demonstrating that enthusiastic kidwatching with feedback can elevate our focus on YOU. I don’t normally share my own tweets in my posts, but as I came to the close of this reflection, I realized that this is the way it was meant to end. 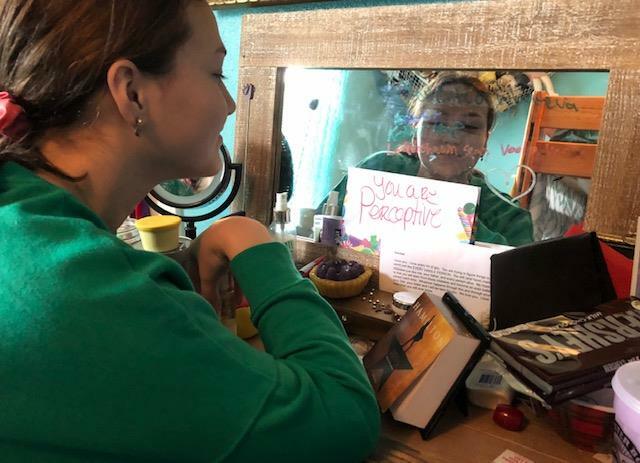 The day after Christmas 2018, I wrote a facebook post on something a wise teacher did for my niece Kendall that brought her YOU to the surface. 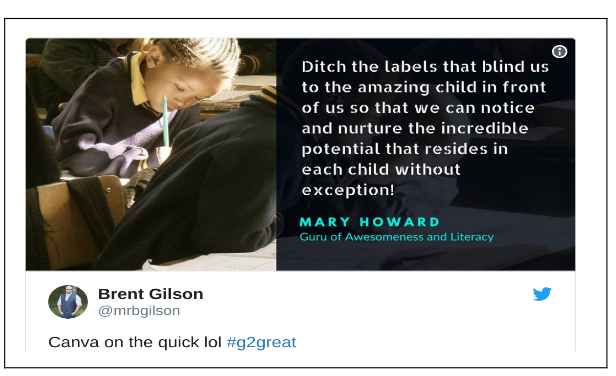 If we truly want to keep students at the center of all we do, then we must make it our professional imperative to notice the remarkable gifts children carry with them within and beyond our four walls. Once we do, we then let them look into the proverbial mirror every day as we celebrate their YOU from both sides. 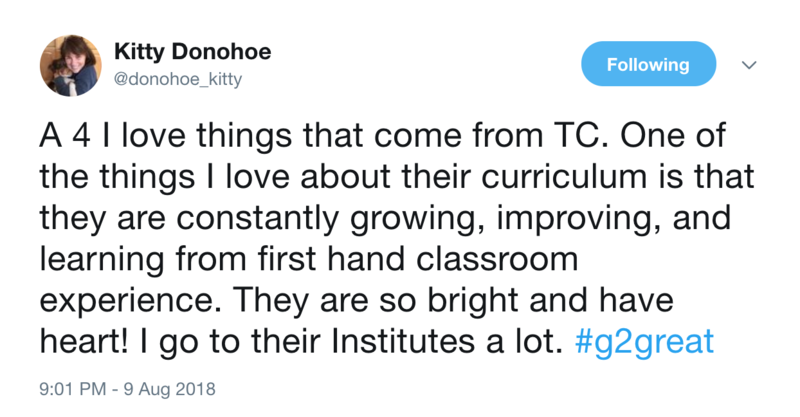 In closing, thank you for keeping students at the center as you thoughtfully sharpen your own lens by gazing through the oh so wise eyes of our children. 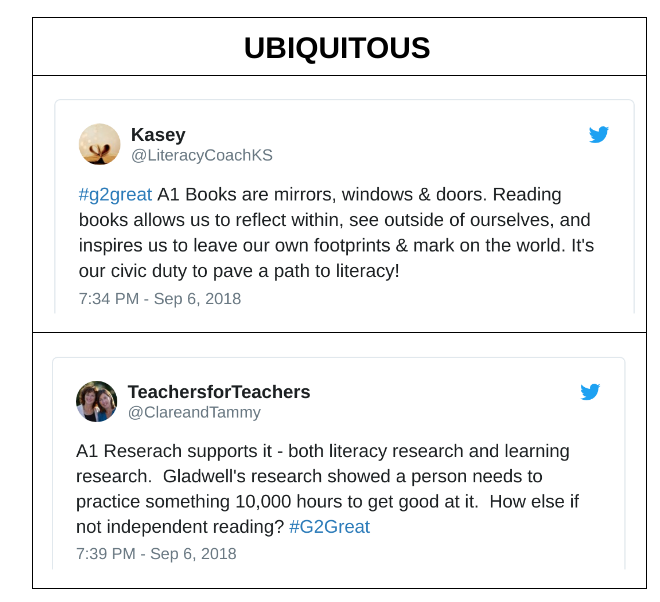 This week, #G2Great concluded a 5-part series, Maximizing Our Potential: Focusing on the Literacy Work that Matters as we enthusiastically turned our attention to Assessment that Informs. 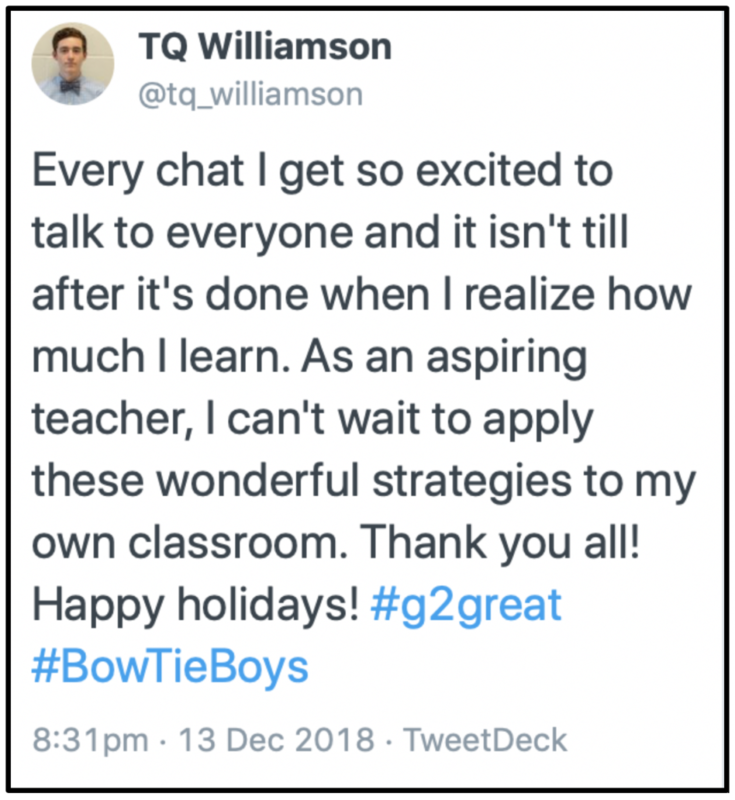 I have loved each topic including Allocating Instructional Time, Classroom Design, Student-Centered Learning and Independent Application, but our final chat in the series became the thread that interweaves each topic together in such a powerful way. 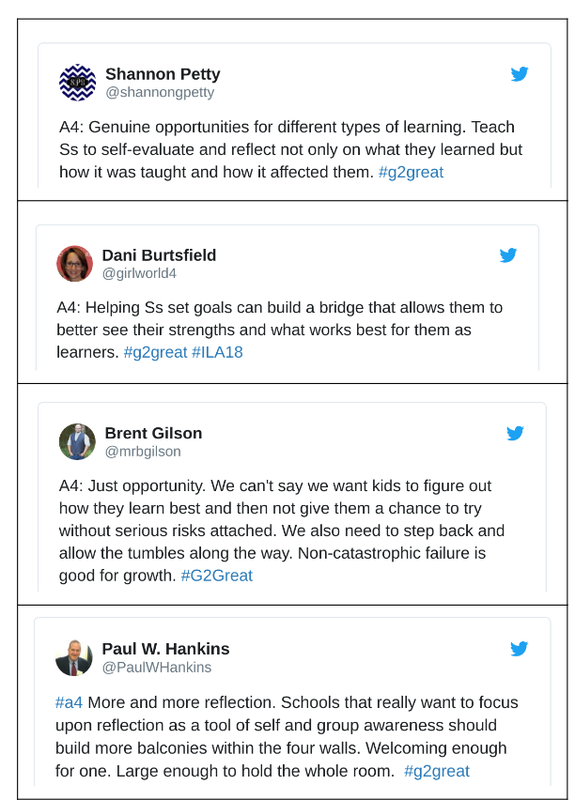 This is not the first time that we have put a broader perspective of assessment under the #G2Great microscope and I can assure you it won’t be the last. 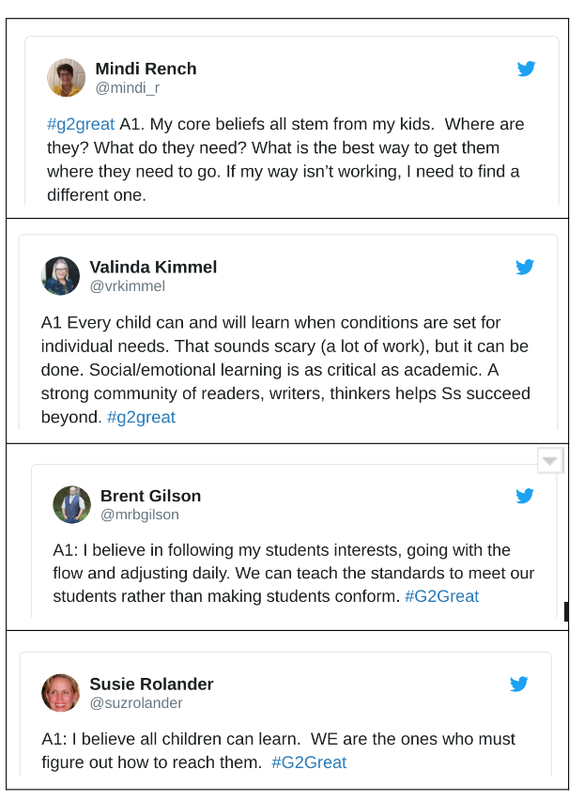 Like each of you, we are concerned about the lingering impact of the data-driven culture that has permeated our schools and clouded our view of the amazing learners beneath that data. 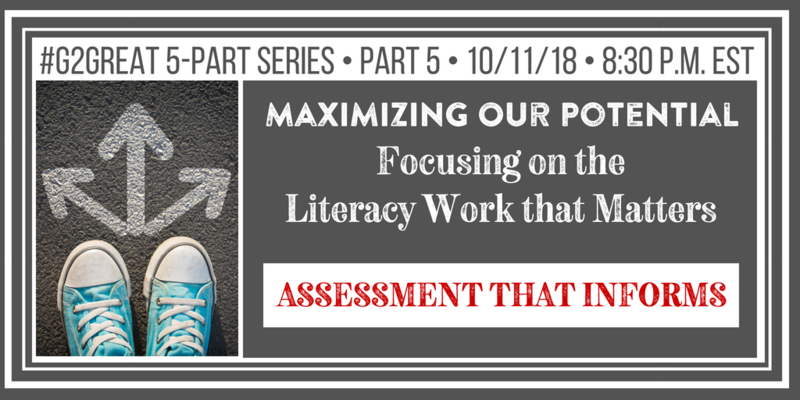 We’ve made many missteps along the meandering pathway that wavers between assessment that informs and assessment that labels. Until we address this mismatch, we are destined to lose our way somewhere between these two contrasting viewpoints. 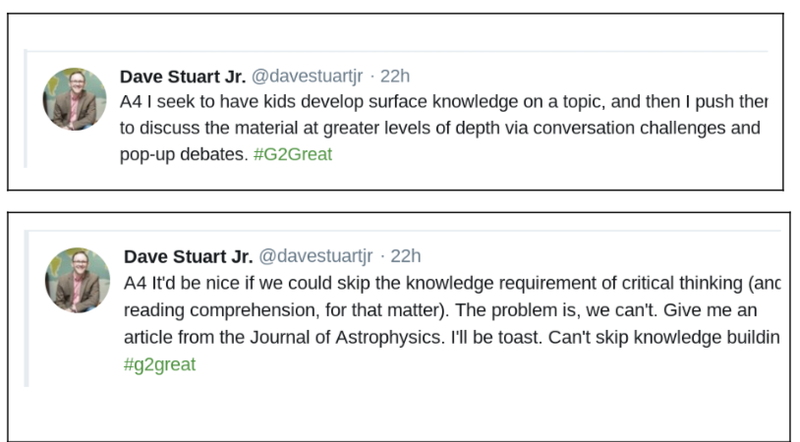 I cannot imagine that any knowledgeable educator would opt for categorizing children over using information that would enlighten our understanding and thus elevate instruction. Numerical data is our reality as grades, scores, levels and color-coded spreadsheets have become the norm. 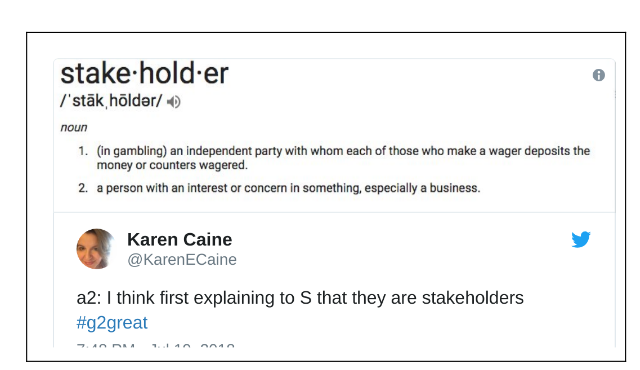 To be clear, the danger does not reside in numbers but in the source of numbers and how we choose to use or misuse them through interpretation and decision-making that can naturally rise from the use, purpose and intent of numbers for better or for worse. To clarify this, let’s look at reading levels. 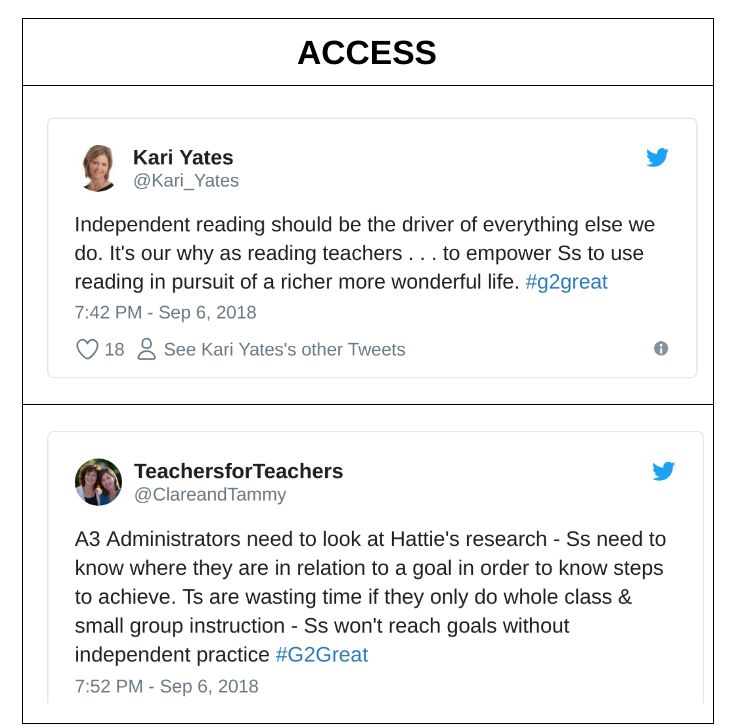 If the source of levels are Accelerated Reader tests used to narrow student text choices, determine who attends AR celebrations, or post AR scores publicly in conflict with privacy laws then we abuse the use, purpose and intent of levels. By contrast, if the source of levels is running records analyzed by knowledgeable educators used as a flexible text selection tool for forming temporary small groups that change over time, then the use, purpose and intent of levels keeps kids at the center. 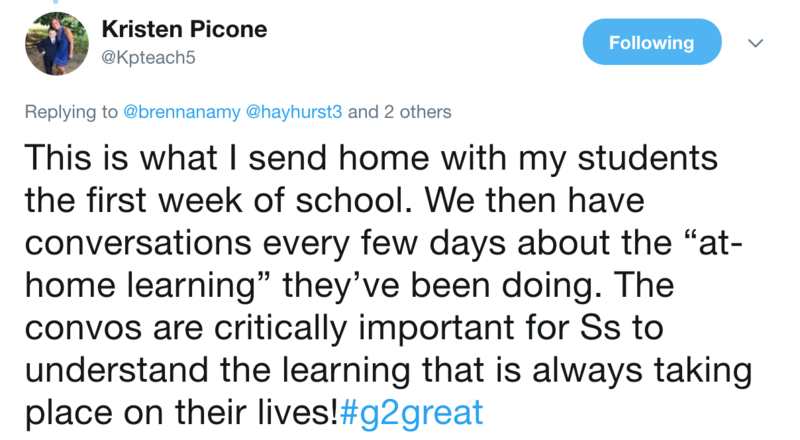 In other words, the quality of our assessment is WHAT we do, WHY we do it and HOW we use this in the most professionally responsible and responsive ways. 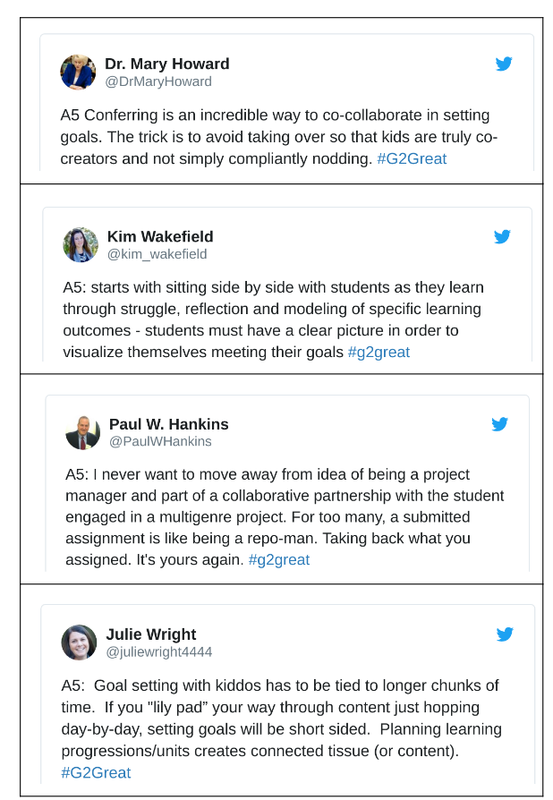 With this critical shift in thinking reflective of assessment that informs, I set out to take a closer look at tweets from our amazing #G2great family to find key points of discussion. 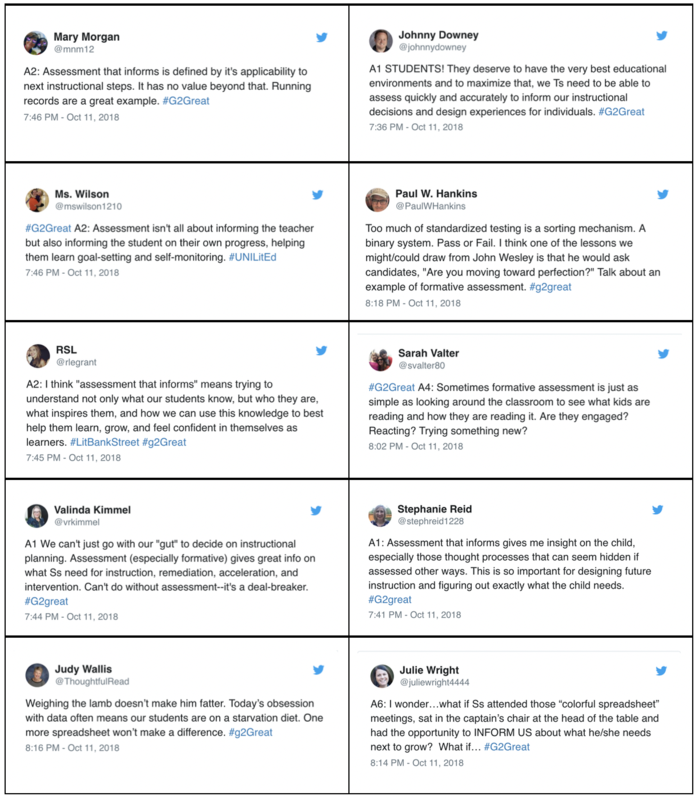 During my joyful twitter perusal, Ten Assessment Heart Guides began to emerge that support our quest for assessment that maximizes rather than restricts our potential. 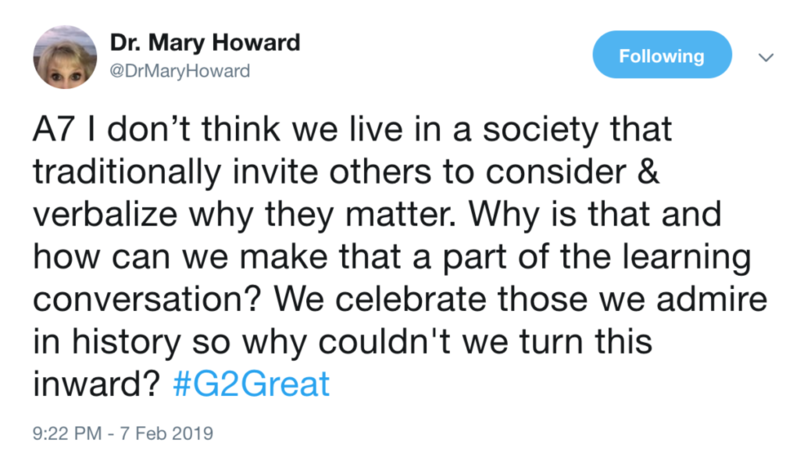 To highlight the heart guides, I’ll share a few of the tweets that inspired my thinking at the end of this post. 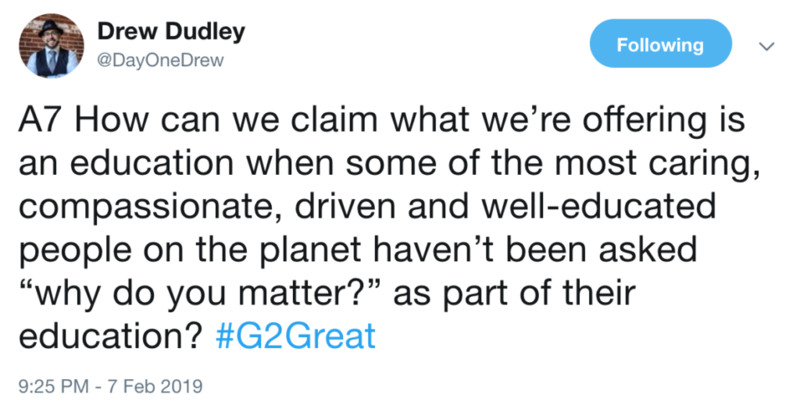 I put this point first because you may as well stop reading unless you take this one to “heart.” The reality is that you all be forced to use data that goes against the grain of research. Acknowledge this reality but refuse to allow it to taint the formative assessment that happens in the confines of your “heart home.” Stop complaining and draw a line in the proverbial assessment sand knowing that no one can rob you of assessment that matters unless you give them permission. So don’t! Now that you’ve broken through the data ties that bind, honor your real assessment purpose: WHY: K-I-D-S. Irrespective of school-based data goals, the ultimate goal of assessment is to understand our learners so that we can design the instructional opportunities they deserve. When we shift our WHY we can shine a spotlight on the whole child and all that entails. When we can do this, the assessment process then highlights the teaching-learning process. This will broaden our WHY which in turn broadens the understandings that we can glean from those assessments. Before we can possibly design the assessment that will help us bring our WHY to life, we must be able to verbalize what we value. Ask, “What do I believe?” and then assess that. Heart data is not about gathering numbers to display on a spreadsheet. It’s about assessing the learning experiences that you value so that you can redesign experiences in more effective ways. 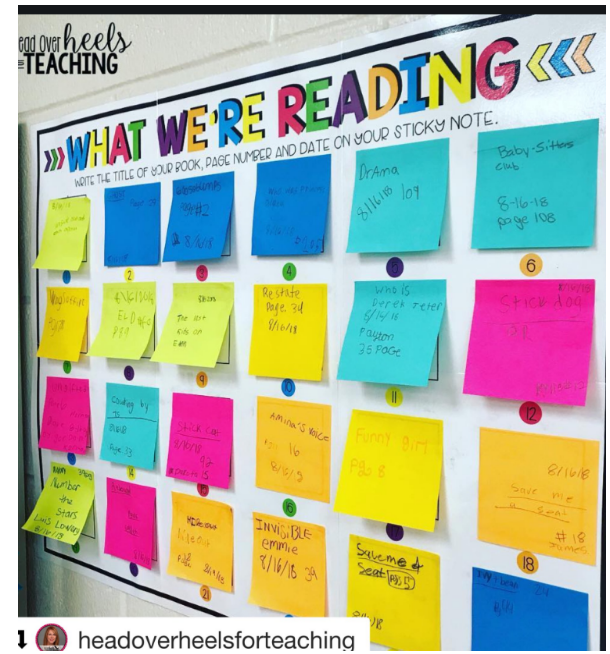 If we value student engagement in reading, then we put worksheets and grade books away and amp up kidwatching as we observe our values in action. Assessment that informs has two distinctive but equally powerful purposes. Obviously the first purpose is to understand each of our learners. But more than that, it is also to understand ourselves. As you assess, don’t just think about what you see and hear as you assess students but also what this says about your professional choices. Quick fix answers are not welcome so dig deeper as you look into the reflective mirror. 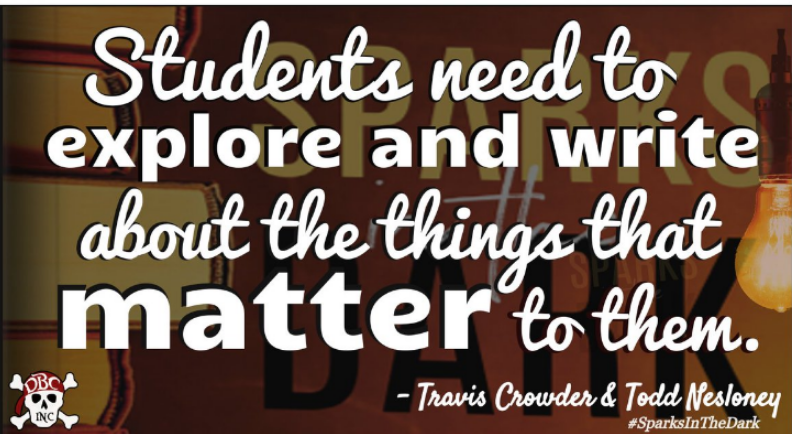 What responsibility do you have in what students were or were not able to do? Own it and take it to heart by your actions. Formative assessment is not a deficit model that reflects a ‘gotcha’ mentality. 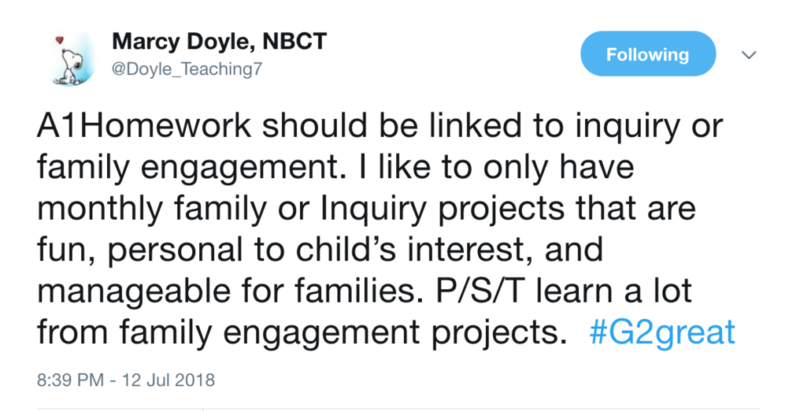 Rather it is a success-based model where we seek to find out what our children already know, do or understand or are on the cusp of knowing, doing or understanding. When we start there, we create a stepping stone to where we might go from here. And don’t keep this success knowledge a secret. Shout it from the highest rooftops so your colleagues, parents and children will be able to celebrate alongside you. A heart-based view is much more beautiful when we all get to join in the festivities. By nature, assessment is confined to one moment in time. While these moments are powerful informants, they are too narrow to give us the kind of information that will have the greatest impact on our practices. But when we stretch our perspective over time, we would begin to notice the patterns that could strengthen our understandings. If we gathered assessments across our learning days in varied contexts, settings and experiences over time, we will have references that confirm, refute and deepen what we know. Assessment is not a process of gathering but one of intentional decision-making. 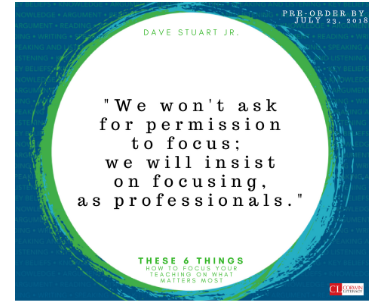 Knowing what children know is only the starting point since we must then consider the next step actions that will gently nudge them from where they are to where they need to be in a timely fashion. The clock is always ticking but for some children it ticks even louder. Honor the discoveries you have made in the assessment process but turn those NOW discoveries into NEXT STEP possibilities and then hit the ground running to put them into place. Some of the best assessment opportunities occur when we don’t even plan for them. Few assessment shifts are more powerful than taking it on the road armed with nothing more than a clipboard, a pencil, and your curiosities about children. Engage your children in on-the-spot conversations by rotating as you transform from teacher to fly on the wall observer. Acknowledge the impact of closing your mouth so they can open theirs since the more they are doing the talking, the more you aren’t. 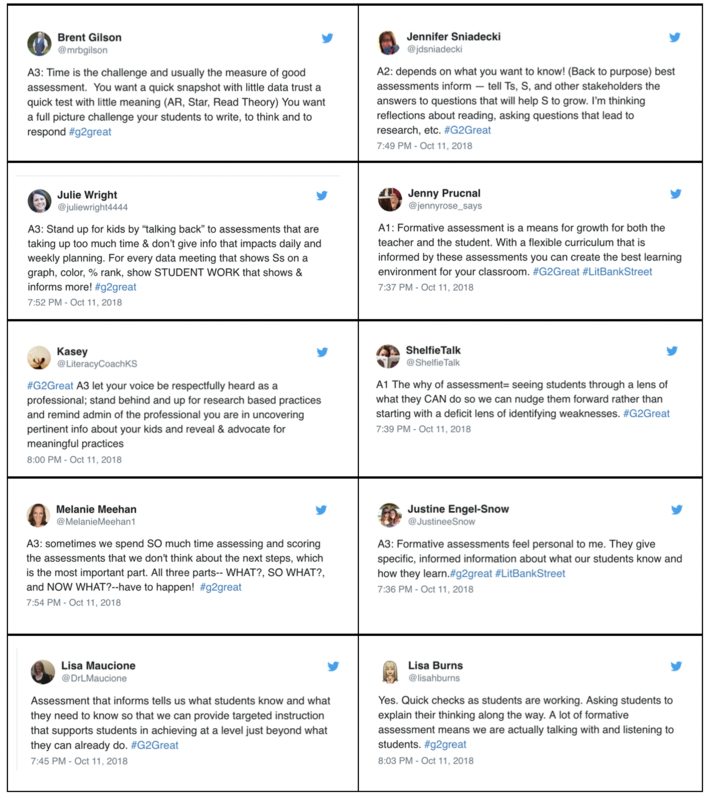 These talk moments where we listen in on student conversations are an assessment goldmine. No matter how skilled you are at the observational process of assessment, it is simply not possible to notice everything. When we assess, we attempt to pay attention to all that children say and do but in the process you will inevitably miss some of the most informative knowings of all. Video tape a lesson and use this to capture the noticings that may reside just beneath the surface. To make this process even more powerful, invite a colleague to help you capture important details you are sure to have missed. 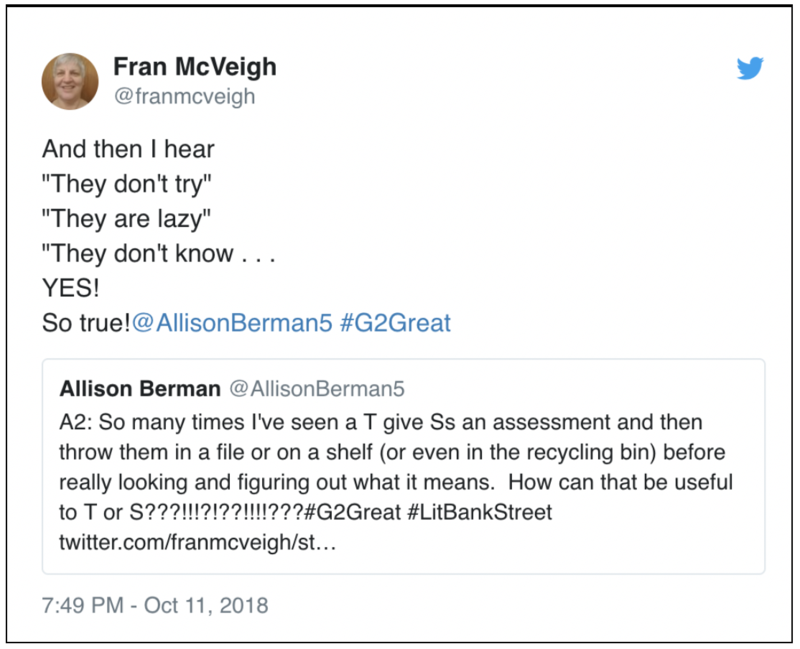 I would be remiss if I didn’t return full circle to heart guide #1 and the most questionable district mandated assessment of all – those dastardly data discussions. I wonder if we would be proud of our dialogue if we imagined that our children were sitting in that room with us. What would they hear? What would they think? How would they feel? Although we can’t invite them to data meetings, we can display their photograph in full view to give those numbers a face. 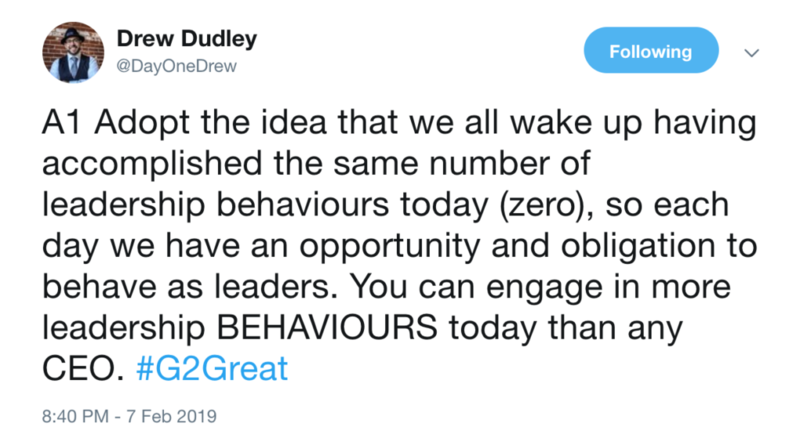 We must never forget that regardless of designated data, we are talking about living, breathing children and the decisions that we make will have a lingering impact on their success or failure. 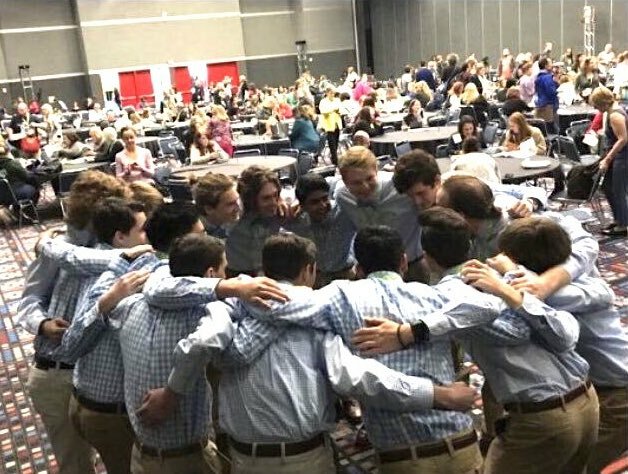 Last week, my friend and co-moderator, Fran McVeigh, eloquently opened her blog post on independent application by reviewing the first three topics of our series. 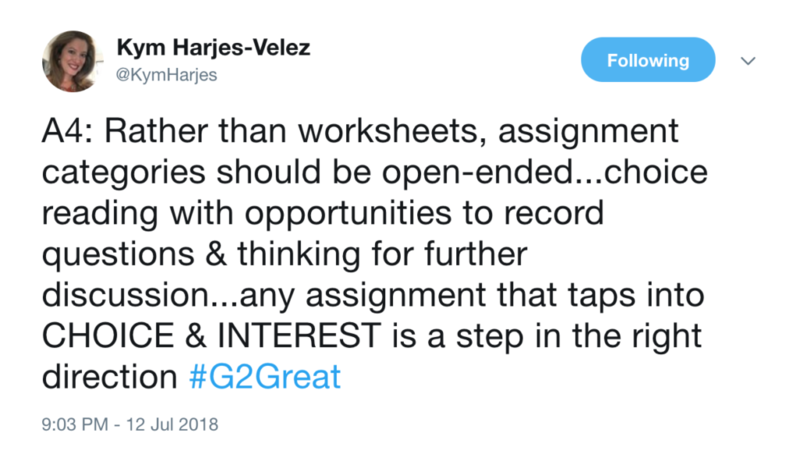 So in celebration of the completion of our wonderful series, I’d like to return to the idea I posed at the beginning of this post describing assessment that informs as the thread that interweaves each topic together. 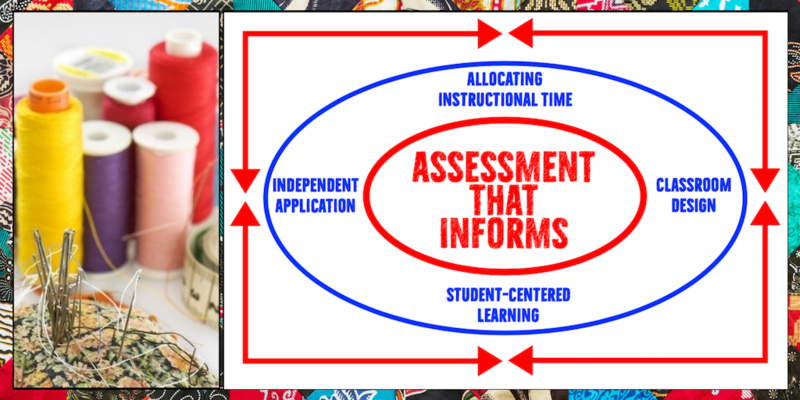 The red outer arrows reflect this ongoing cyclical process where instruction and assessment are inseparably connected. This is not based on scripted instruction using scripted assessments out of obligatory compliance to a scripted program. 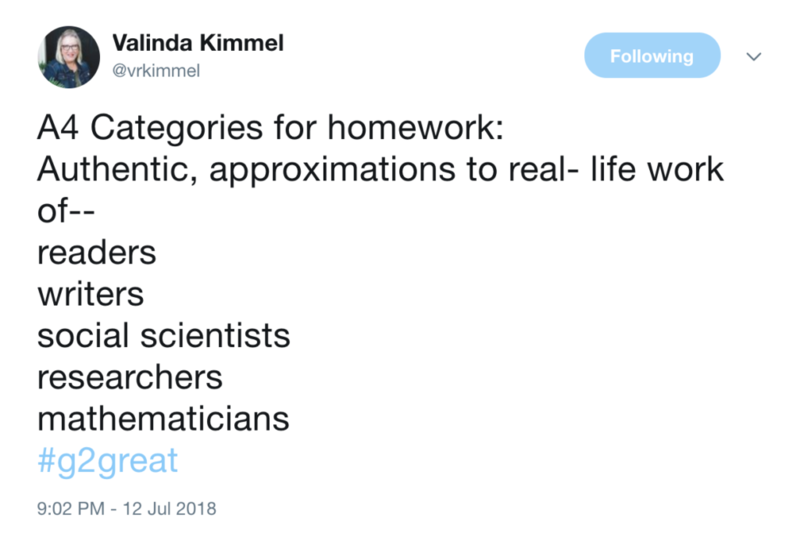 Rather, it is based on knowledgeable teachers who use assessment informants to design research-based literacy practices that interweave assessment and instruction based on the unique learning needs of students. These informants can change our thinking and thus our instruction as new informants support or refute new thinking. Publisher-driven directives could never accomplish this dynamic process. 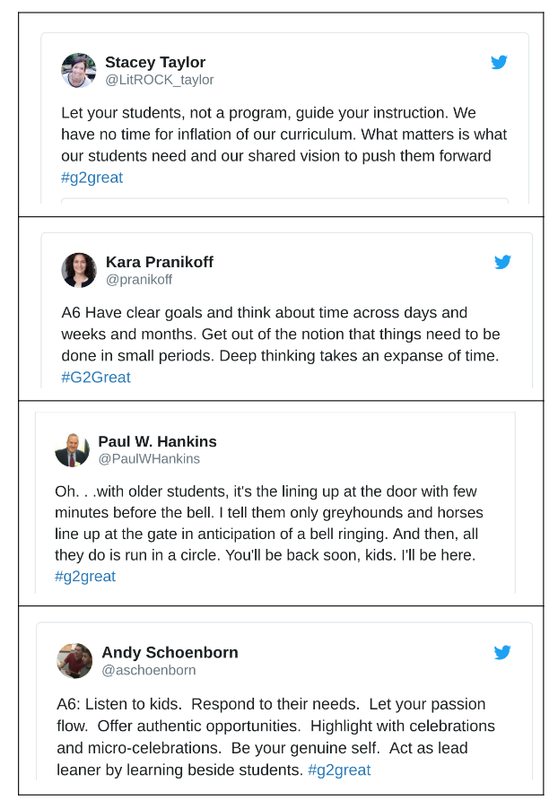 As I pause for a moment to soak in these heart guides inspired by our #G2Great family, I want to express “heartfelt” appreciation for each of you who are willing to call your own teaching to task. We may live in a politically fueled data driven culture, but we do not need to park our hats there my friends. My ten assessment heart guides are critical and each of them are all feasible when you let your heart lead the way. Never lose sight of the role you play and what can happen when you take ownership of all that you do. 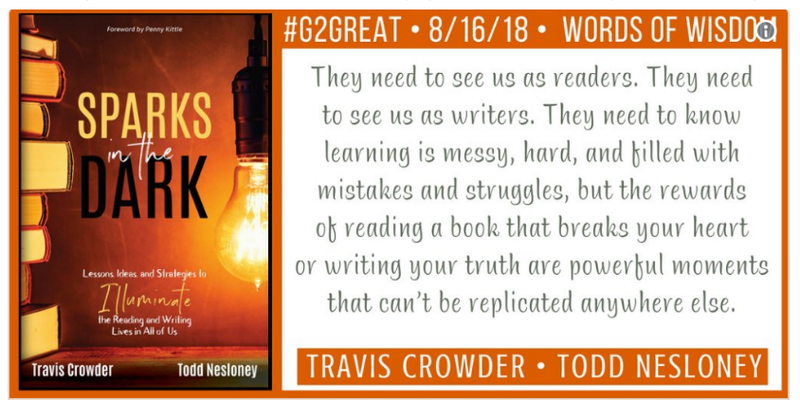 From the bottom of our collective hearts, we are forever grateful to you for bringing your heart to #G2great each week! 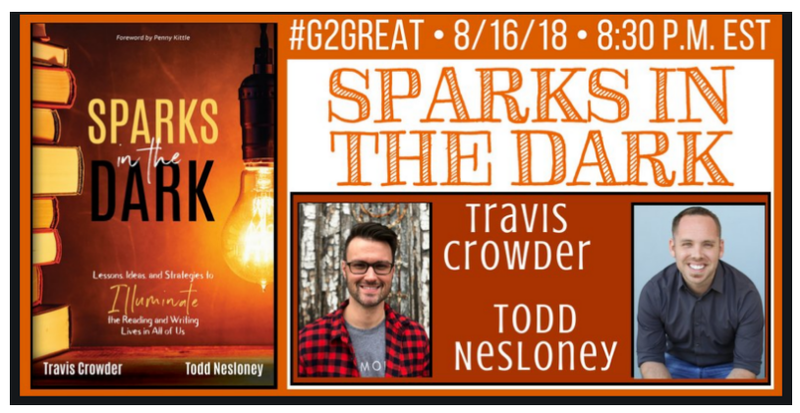 On September 6, 2018, the stars aligned, the chorus appeared from heaven, and the #G2Great chat was literally almost trending from the first minute because Independent Reading is huge, hot, and hard to say “no” to. It would have been easy for teachers and edu-friends to say, “I’m busy. I will catch this topic later.” For many attendees, it was the first week with students back in school. For others, school has been in session for two, three or even four weeks. But our crowd was splendiferous and the learning was off the charts. It was inevitable. 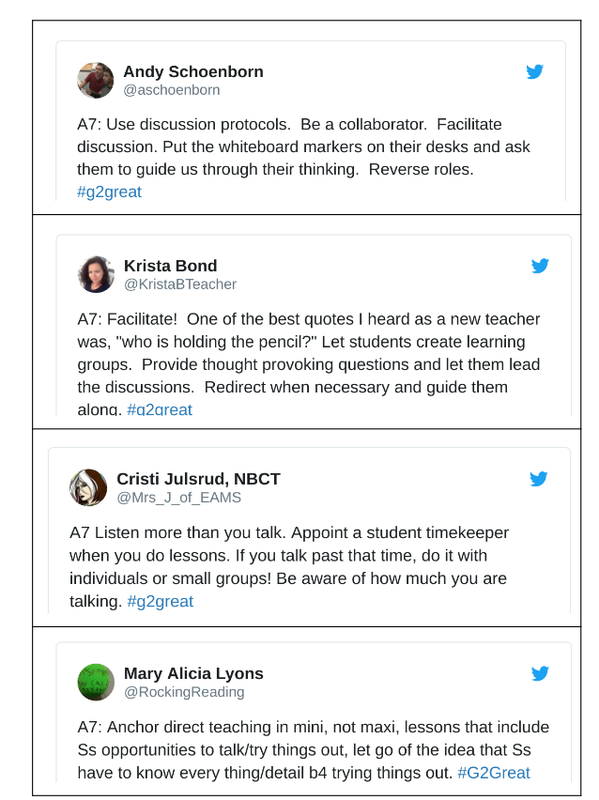 The quotes for this chat included words of wisdom from such literacy greats as: Donalyn Miller, Stephanie Harvey, Annie Ward, Ellin Keene, Nancy Atwell, and Richard Allington. 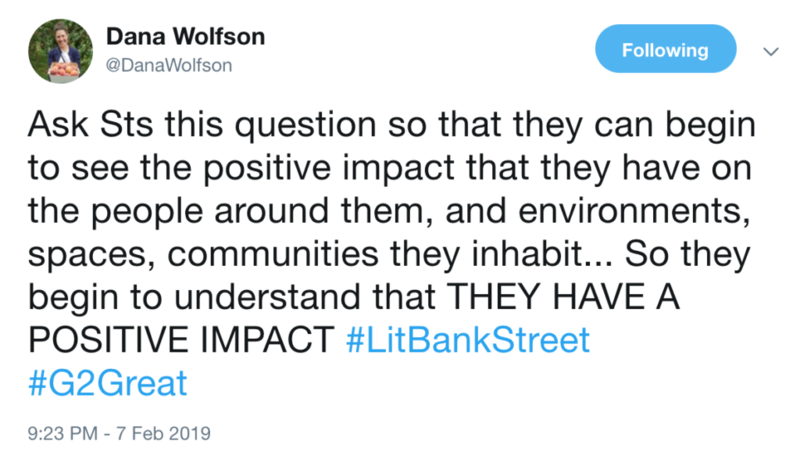 But just as I was narrowing down my final selection of tweets for this blog post, ILA issued their “Children’s Rights to Read” (link) and I was captivated. Ten rights. Ten simple rights. Ten rights that highlight the need for access and equity. Ten rights that don’t use the word “Independent” but wouldn’t that just be a redundancy? The “Children’s Rights to Read” are, in truth, aimed at the 750 million people across the world that cannot read and write at a basic level. This notion of “Rights” inspired me to think about whether these ten rights are in place in ALL schools in the U.S. and I am saddened by the knowledge that we have no evidence that they are firmly established in every school building. The positives in our chat were that I found the following concepts: value, access, love, ubiquitous, equity and sustenance. In the explanations for each concept, please note the crosswalk for the match to the “Children’s Rights to Read” as well. Access is so multi-faceted that is difficult to pick a starting point. The number one criteria for access is often touted as time. Is it perceived as a necessity for all students or a luxury? That depends on the value of that time. 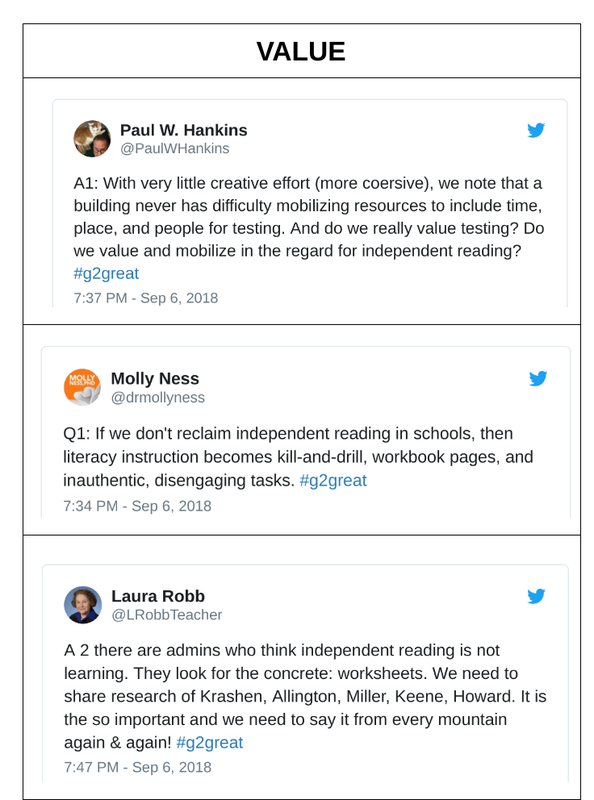 Would any teacher say that Independent Reading was not important? Then schedule it first. In ink. Boldly. Confidently. After time, the next issue is texts (physical books, magazines, and digital resources including video and art). 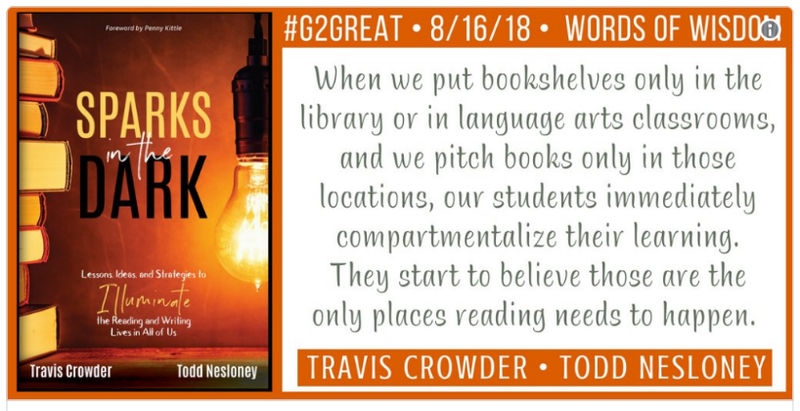 Where does a teacher develop that classroom library? What about the new teacher with an empty room? 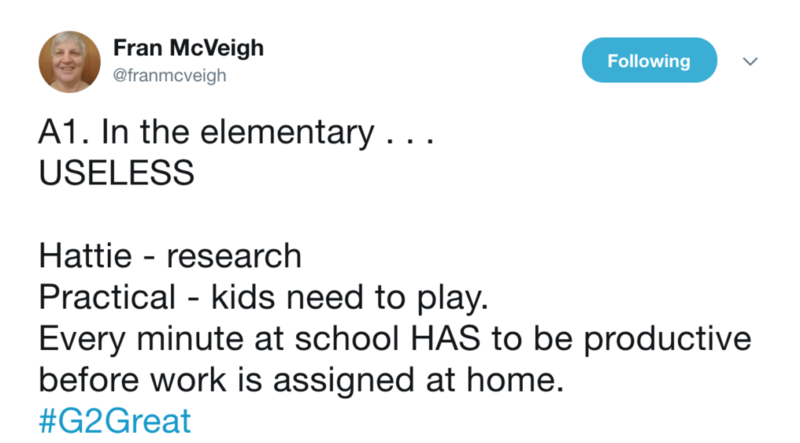 But broader than that: is there a classroom library in the science lab, math classroom, economics classroom, and more importantly in the office waiting area? Location of texts could be access, value or equity. Other aspects of access to consider may be more subtle. Access to time to talk about books. Access to a knowledgeable adult/teacher to conference with. Access to that next book on the To Be Read (TBR) stack or that long awaited book that just arrived from the publisher when there are NINE names ahead of yours on the waiting list. Access to books about people like you, your community, and your background. Access to books that interest you. Access to new books that have recently been published. Access to conversations about the books with other kids in your class, your school, your state, or your country. Access = choice of the right texts at the right time! A love or passion for reading begins at an early age. It is supported when we read aloud, read along with children, and listen to them read. That takes time and texts. It may begin at home or at school. How do we continually grow and nurture book love in our students? 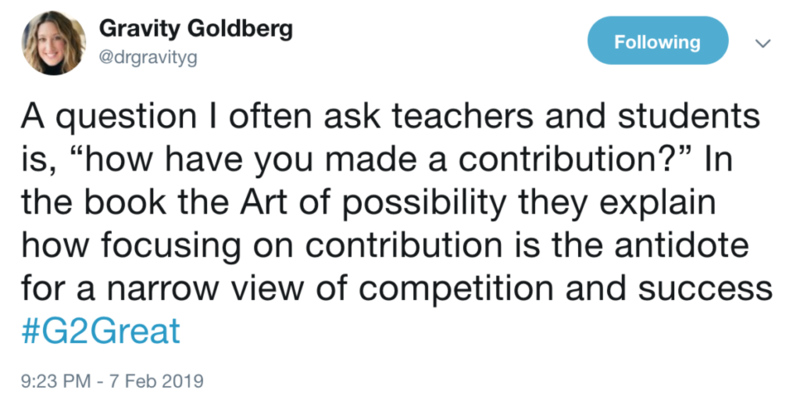 As parents, teachers, librarians, or administrators – those many roles that we have – what is our end goal for students? Will their score on a summative state assessment be what the student takes away from their time in the classroom? Or will it be the fact that you helped them fall into love with reading? You helped them explore their interests. You helped them find books and authors that opened whole new worlds. They grew. They changed. They lived their lives differently because of that new found love or passion for reading. 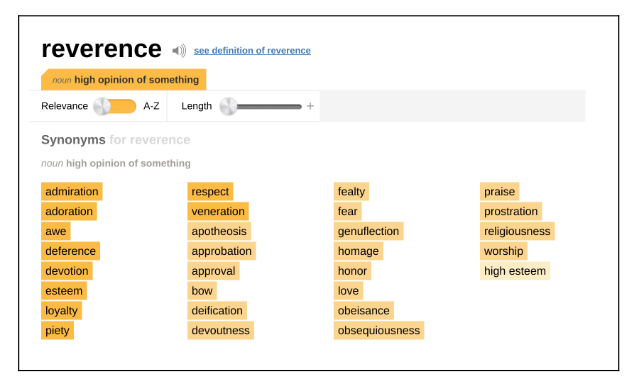 When something is ubiquitous, it is pervasive, worldwide or universal. 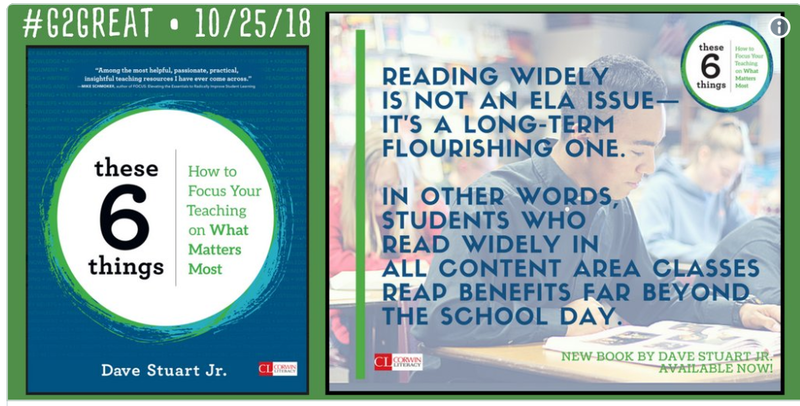 The belief that Independent Reading is a mainstay of reading instruction is ubiquitous for teachers who have a goal of helping students get lost in that “just right” book. Teachers who are readers. Teachers who love books. Teachers who know which titles are being published. 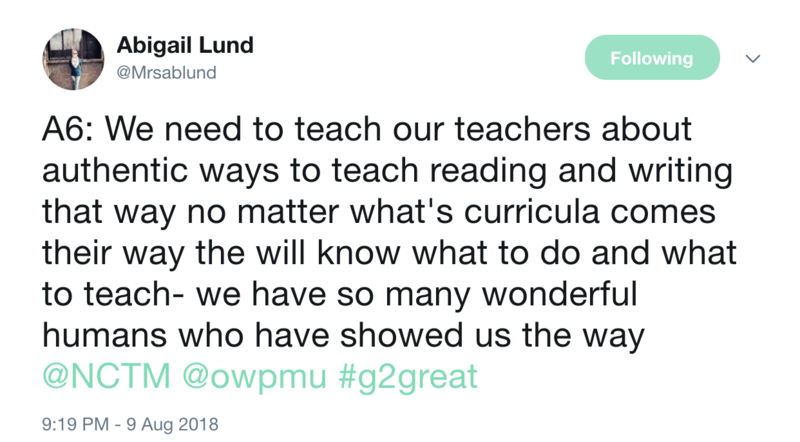 Those are the teachers who can connect students with books that will change their lives and put them on a path to continued reading. 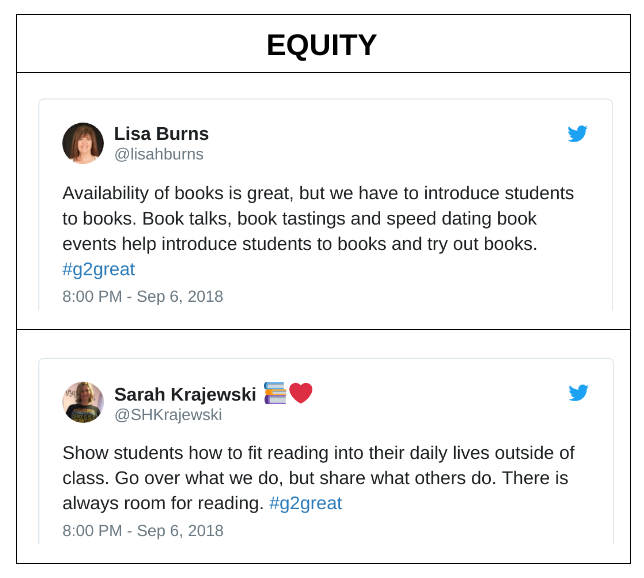 Equity in reading means that all students have the opportunity for Independent Reading. 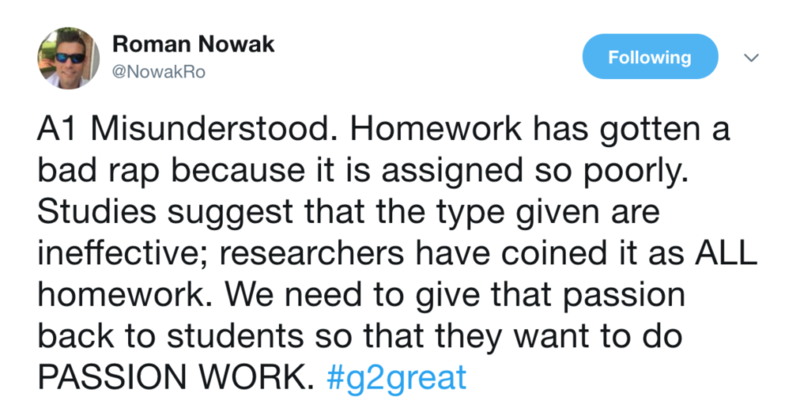 It’s not “what you do when your work is done” because some students never do get their work done. It’s not “pull-out intervention” time. It’s not “pull-out for special education service minutes.” Equity also means that everyone has access to texts at school and at home. Lack of wifi does not limit access to digital texts. 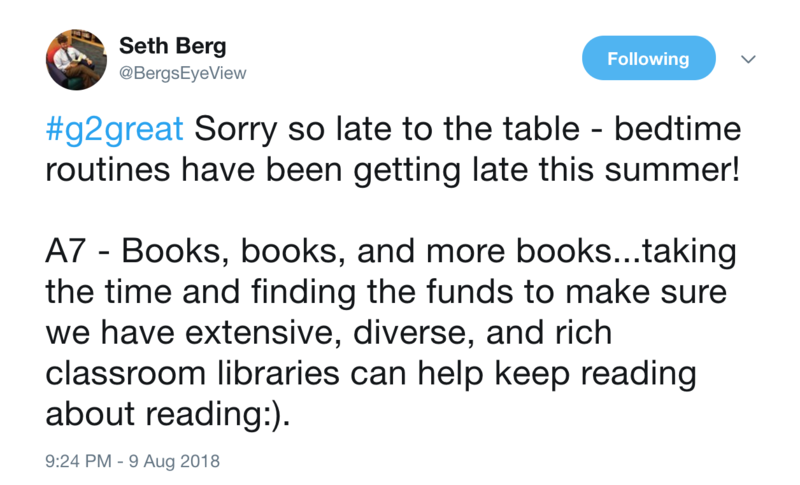 Students and parents are not expected to personally buy the books on the summer reading lists. Students who are primary caregivers in their homes are not judged when reading logs or notes to parents working multiple jobs simply forget! 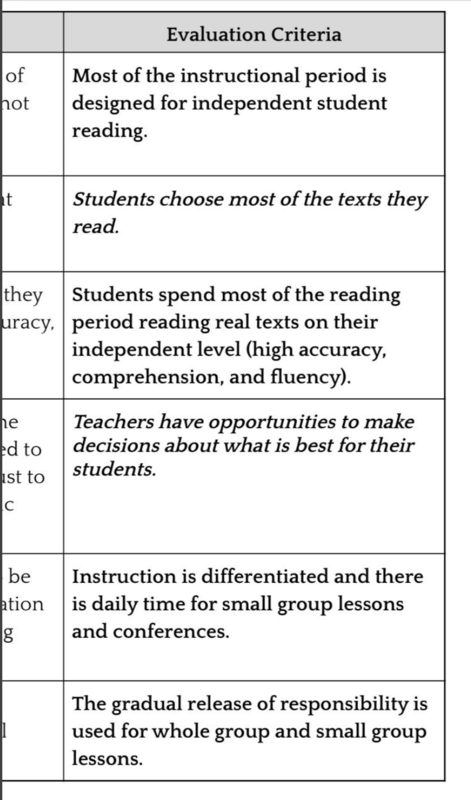 When equity and Independent Reading are both priorities, then it is a part of Tier 1 for every student. All students. Every Student! How important is reading? That seems to go back to the value of reading. Is your view of reading that it is necessary for life? Does reading nourish your mind, thinking and soul? Do you agree with Rudine Sims Bishop that texts are mirrors, windows, and sliding glass doors? If yes, than having a reading life is a part of your required sustenance plan. Not a luxury. Something that must be prioritized into a daily routine or schedule. Yes, it was a bit cheesy to use “Value” as the first concept. But it’s important, critical, imperative! 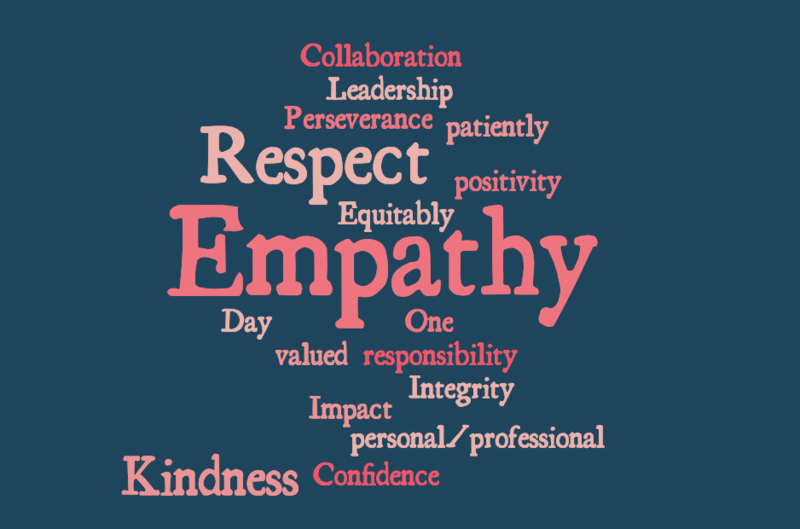 It all comes down to our professional values. What do we hold near and dear? 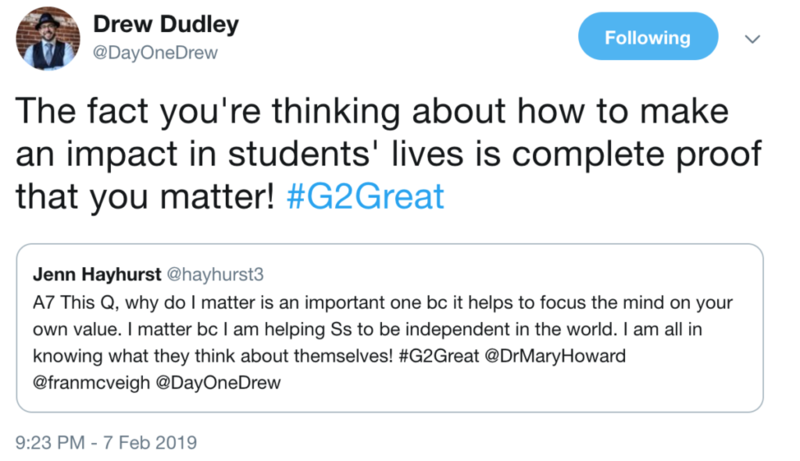 What do we know is vital for our students? 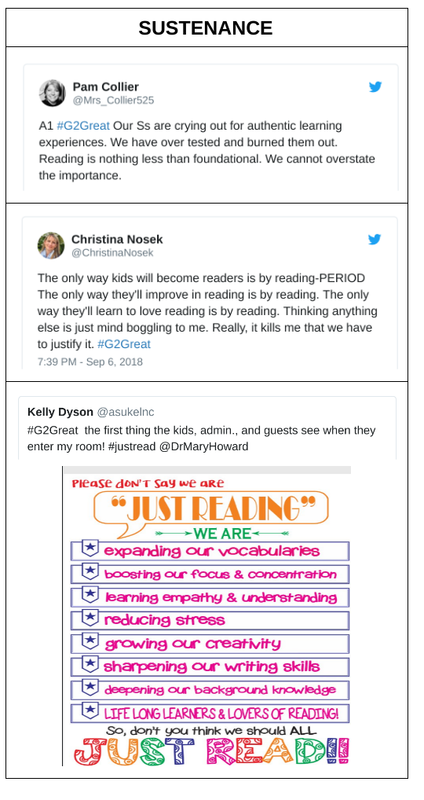 What does it take to create readers? What does it take to create literate beings who continue to grow and learn once they leave our school halls? If we value Independent Reading and make it a professional imperative, it will be a priority every day in every classroom. If we value Independent Reading and make it a professional imperative, time and money will be allocated to support it. 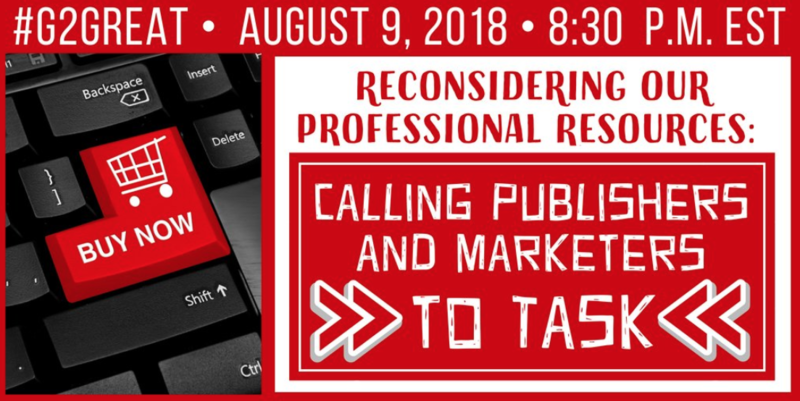 If we value Independent Reading and make it a professional imperative, resources from discontinuing old antiquated bribes like AR can be re-purposed to support it (Thanks, Brent for that idea!). 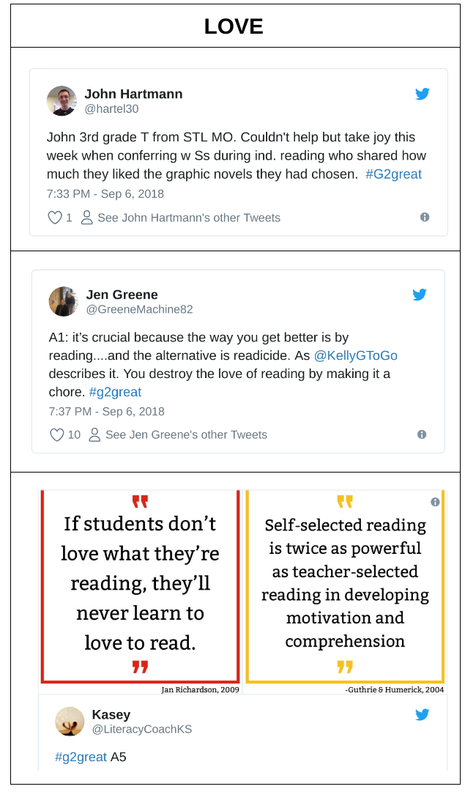 If we value Independent Reading and make it a professional imperative, students will love to read, will be able to read and will choose to be readers all their lives. 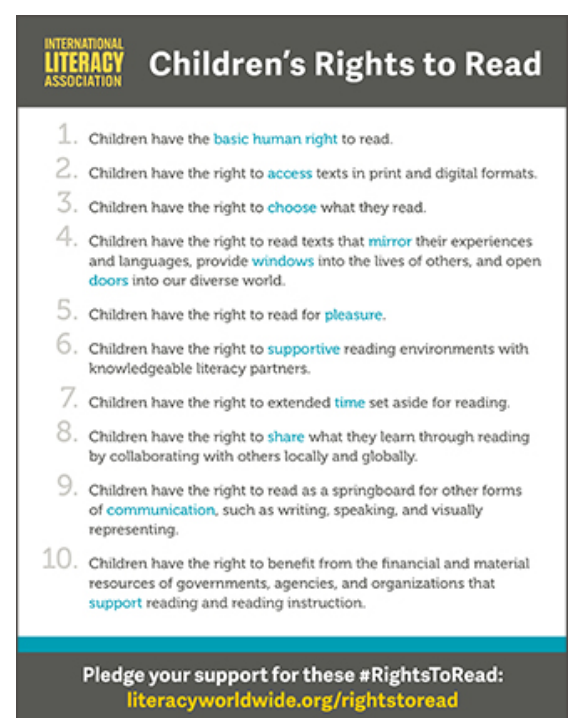 Just a quick reprise for “Children’s Rights to Read.” Those 10 Rights above are huge. Note that Value, Access, Ubiquitous, Equity and Sustenance connected to all 10. ALL 10! And there were a total of 55 connections out of a possible 60! 92% means Independent Reading as a way to support Children’s Rights to Read is a Professional Imperative!